It’s always been clear that water is essential to life. But science is still discovering new levels to this very deep relationship. By weight, an average adult human can be up to 60 percent water (children up to 75 percent). But if you consider our composition in terms of molecules, we’re practically all water—nearly 99 percent. Water molecules are so tiny compared to the other types of molecules in our body that we can fit many more inside of us. And we need them all. Every aspect of our physiology relies on water to function. It gives fluidity to blood, lubricates joints, and carries waste and nutrients in and out of each cell. Our lives are so water-dependent that we would perish in just a few days without it. We understand our need for water more than ever, yet we still struggle to get enough. By one recent estimate, as many as 75 percent of Americans suffer from chronic, low-level dehydration. We have indoor plumbing, a staggering variety of beverage options, and constant reminders to drink more. So what’s the problem? According to integrative physician Dr. Dana Cohen and cultural anthropologist Gina Bria, one major reason is that modern life dries us out. In their new book, “Quench: Beat Fatigue, Drop Weight, and Heal Your Body Through the New Science of Optimum Hydration,” Cohen and Bria highlight multiple factors that contribute to our chronic water loss in the 21st century. We may have easy access to water, but moisture is being sucked from our bodies in ways our ancestors never experienced. One factor drying us out is all the time we spend inside. Some of our hydration comes from the moisture in the air we breathe or absorb through our skin, and indoor air is significantly drier and less oxygenated than outdoor air. Our moisture-hungry bodies were not designed to spend so much time in tightly sealed, climate-controlled capsules. Airplanes are the worst offenders, but riding for hours in a car with the windows rolled up can take a toll too. Cellphones are another dehydrating factor. There’s heated debate about how much of an impact all the microwave radiation emanating from these devices has on our cells, but it is clear that our habits leave a mark on our biology. Because we have to manufacture a new round of neurochemicals every time we refocus our attention, all of that scrolling and multitasking can slowly but steadily drain our hydration. On top of this, we’re often out of touch with our thirst. Cohen says many of us have conditioned ourselves to ignore it. We intentionally don’t drink as much as we know we should because urination is an inconvenience. If we’re busy, or just lazy, going to the bathroom can seem like a chore. But our bodies are designed to get up and pee every two to three hours. We make a hormone that stops this cycle so can we sleep through the night. But it works much better for those who drink enough during the day. Modern medicine excels at diagnosing and treating severe dehydration (a loss of more than 10 percent of total body water). 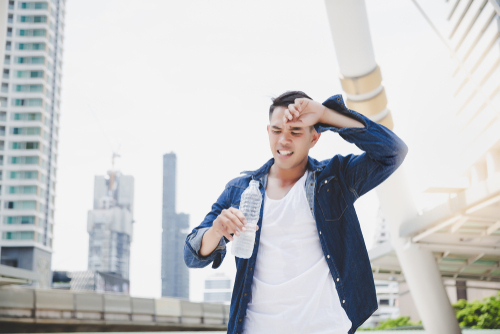 However, doctors rarely consider mild dehydration as a cause for disease, despite evidence for numerous health consequences linked to it: headaches, poor concentration, fatigue and anxiety, as well as constipation, muscle cramps, and more. And it doesn’t take much water loss to make an impact. One study found that women performed worse on cognitive tests when they were just 1 percent dehydrated. Another study found that just 2 percent dehydration impacted blood vessels as much as smoking a cigarette. Preliminary research suggests that chronic, low-grade dehydration could even be a major cause behind obesity, diabetes, hypertension, and Alzheimer’s. In addition to the contemporary drains on our hydration, we lose between two and three liters of water each day the old fashioned way—through breath, sweat, urine, and bowel movements. We need a regular strategy to replace it all. We’re often told that nothing hydrates us as well as plain water, but there are far superior sources. One example is found in Chris McDougall’s bestselling book “Born to Run: A Hidden Tribe, Superathletes, and the Greatest Race the World Has Ever Seen.” It showcases the Tarahumara people of northwestern Mexico. Young men from this tribe run 50-mile marathons for fun. They keep themselves hydrated not with plain water, but a mixture of fermented corn beer and chia—a seed that turns gelatinous when soaked in liquid. Compare this to the eight-glasses-a-day advice we commonly hear today. We think it replenishes, but it may actually be setting us back by flushing out electrolytes and nutrients that facilitate hydration. Hydration is not necessarily about the quantity of liquid you consume, but about how well your tissues absorb it. That’s why Cohen and Bria recommend that we increase our consumption of juicy plants. There are special qualities to the water found in plants that make them so hydrating. First, the fiber in fresh fruits and vegetables help us retain moisture so our cells have more time to integrate it. Plus, it comes already purified, alkaline, nutrient- and mineral-rich, and easier for our cells to absorb. Some scientists believe plant water may be evidence of a fourth phase of water, sometimes called “structured water” due to its crystalline molecular arrangement. Somewhere between a solid and liquid, structured water behaves more like a gel. Cucumber, watermelon, and iceberg lettuce are rich sources of this stuff, but it becomes even more gel-like in plants like aloe and chia. Much of the research on structured water comes from Dr. Gerald Pollack, who runs a water lab at the University of Washington in Seattle. Pollack has found that structured water carries a negative charge and that its unique molecular design (H3O2 instead of the typical H2O) has a self-purifying mechanism. Pollack calls this special water “exclusionary zone” or “EZ water” in reference to its ability to rid itself of undesirable particles. In a 2016 TED talk sponsored by the Hydration Foundation, Pollack explains that EZ water can be made from regular water, but the water found in plants comes ready made in the EZ state, which is why fresh vegetable juice is so healthful. Bria and Cohen support fresh juices, but they prefer smoothies for the added fiber. Their book contains several smoothie recipes using various combinations of water-rich plants, a pinch of sea salt to boost mineral content, and ground chia seed. They also recommend strengthening the hydration potential of plain water by adding some plant power—such as freshly squeezed lemon, a sprig of mint, or a chamomile tea bag. Another unexpected strategy for improving our hydration is movement. Once we drink our smoothie or lemon water, the moisture still needs to be delivered to each cell, and if we don’t move enough, many cells may not get their fill. Scientists previously believed that blood and lymph nodes were the only ways that liquid was transported through our bodies. But celebrated French hand surgeon Dr. Jean Claude Guimberteau discovered another system. Pushing an endoscope through connective tissue called fascia, Guimberteau revealed a web-like network delivering drops of water. His work is revolutionary because fascia was previously considered an inconsequential bit of tissue, sort of like biological packing material stuffed around the more important structures like muscles and organs. Guimberteau demonstrated that fascia moves water and conducts electricity. This means that if the fascia is hard and stagnant, hydration has a hard time reaching neighboring cells, eventually leading to pain or other problems. But just a little movement can get things flowing. “It’s very instinctual because we know we have to move our joints to lubricate them. Now we really understand why,” Cohen said. To hydrate down to the cellular level, Bria and Cohen recommend what they call micromovements—small gestures to stimulate fascia. Micromovements require much less commitment and exertion than a full exercise routine, but over time they may inspire one. Recent science confirms that just a bit of movement may have a huge influence on our longevity. A study published in 2016 looked at nearly 13,000 British women who sat for seven hours a day. Those who didn’t fidget much saw a 43 percent increase in mortality risk. Middle or high category fidgeters saw no increase in risk. In the modern environment, our movement is often constrained. Micromovements are a way to adapt. Plus, they feel great. “When you understand how much movement shifts water through us, you want to start your own experience of fluidity,” Bria said.